In the following section, we address the questions most often asked as people learn more about the Central Library project of Lincoln City Libraries. Answers will be updated as additional information becomes available. Will there be public libraries in the future? 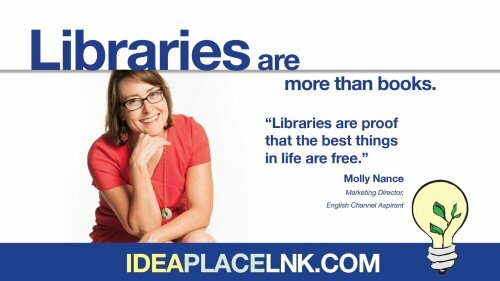 “Libraries Are More than Books.” Libraries are about education, learning, literacy, and literature. People who have seen public libraries as primarily warehouses for print books often assume that as more books become electronic, libraries will lose their reason for being. 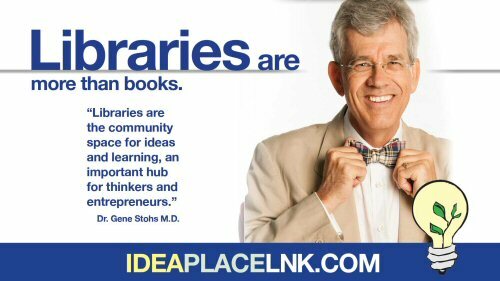 In truth, public libraries for years have been decreasing the amount of space taken up by books and other materials, and focusing on spaces for people. They have emphasized services such as preparing children for school, providing necessary technology and Internet access, and welcoming people to public spaces for tutoring, study, and gathering. 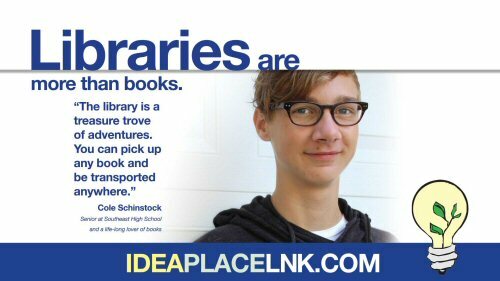 Public libraries are among the key players in community campaigns to increase graduation rates, support grade-level reading, and create a city that is attractive to companies seeking to re-locate. Recent research (from the Pew Research Center) shows that the millennial generation uses public libraries more than other age groups. With the surge of e-readers, many people ask why a forward-thinking community should invest in a new Main Library. “Public libraries in the twenty-first century are more needed and relevant than ever. Traditionally the repository for a collection of printed materials curated and collected by the library, the public library now serves an ever increasing list of needs and services. The quality of the public library is now assessed by its ability to connect patrons to the world, and its ability to be a partner in addressing (often in conjunction with other agencies and institutions) local cultural and social issues. Accordingly, libraries across the country are experiencing a rapid and sustained increase in the use of their facilities, collections and services. Unfortunately, many library buildings, designed for the traditional role of library service, limit their institution’s ability to address local needs. The goals for a new Main Library are primarily rooted in the ability of the new facility to adapt to change. The constant in public library service for decades has been change. This change has accelerated significantly in recent years. Trends at Lincoln City Libraries have paralleled national trends. Checkouts of materials are maintaining or decreasing slightly. Electronic access to downloadable audiobooks and e-readers is growing. Attendance at special and ongoing events for children is strong. Why a New Central Library? Throughout the country, all kinds of cities are enjoying great payoff in their investment in a new Central Library. Bennett Martin Public Library, the city’s current Main Library which opened in 1962, has been thoroughly studied, with recommendations to re-locate the Central Library facilities elsewhere. With the remarkable renaissance of Lincoln’s downtown, this is an excellent time to site a new Central Library in the heart of the city. Lincoln’s Central Library includes two special services, the Jane Pope Geske Heritage Room of Nebraska Authors, and the Polley Music Library. Both of these services are unique to the Central Library, and both are resourced through privately-held funds. The Central Library also includes support services for the full library system, such as administration, materials processing, and information technology. In Lincoln, the Central Library also serves as the neighborhood library for the center of the city, with its dense population, low-income areas, and planned concentrated population growth. Combined with the people who work in the downtown area, this part of the city includes many library users. Considering how a new Central Library fits into current library services, Lincoln City Libraries completed its “quadrant plan” in 2002, when the Eiseley and Walt Branch Libraries opened in the northwest and southwest sections of the City. Overall library use increased significantly with these new facilities. Similarly when Gere Branch Library was expanded in 1993, overall use increased greatly. Other cities that have built new Central Libraries, such as Madison, WI, and Cedar Rapids, IA, have seen clear success in terms of expanded use and strong service to the full community. We ask that you imagine what a powerful new Central Library could do for our community—not an extravagant monument, but a place where reasonable investment leads to great dividends. Lincoln is a city that values education. A new Central Library will stand as a testament to that value and afford the whole city opportunities for academic success and lifelong learning. Directing energy and investment toward a Central Library adds an important aspect to Lincoln’s growth—a showcase and workplace for education, equal opportunity, and lifelong learning. The Downtown Lincoln Association and the City of Lincoln Planning Department are engaged in creating a new Downtown Master Plan for Lincoln. Interested people will find background, meeting and survey information here. Lincoln’s downtown functions as the strong core of the city. Downtown is considered the heart of Lincoln, it belongs to the whole city, and it represents the whole city. Decades of leadership have worked to keep our downtown strong and to support a diversity of uses. This has been considered important to the quality of Lincoln overall. As Lincoln grows along at its edges, maintaining the health of the city’s center requires ongoing investment. A strong downtown Central Library helps to maintain the vitality of the city’s older core. The library’s downtown service area includes the largest population of our five largest library service areas, and the lowest per capita income of those areas. Plans for future development include significant housing increases. Currently, Developments such as the West Haymarket and the Telegraph District continue to grow the number of people working downtown. Several City documents address the library’s situation downtown. The City’s Capital Improvements Plan (CIP) describes various Capital projects that will require significant City investment. It shows a new Main Library in the 2019-2020 fiscal year for an approximate cost of $42 million. These figures are based on the 2012 Main Library Vision and Concept Study and will be updated. The City’s Comprehensive Plan indicates that libraries should keep their center in downtown Lincoln (section 8.2). The Pershing Adaptive Reuse Study mentions a library at various points, for example, page 19. Library Service Areas by Population Size. This document measures the number of people living within a two-mile radius of the Central Library and four largest branch libraries, and within a one-mile radius of the neighborhood libraries. Areas of Downtown Development. This document shows that traditional downtown, including the Pershing site, are within areas of development in all directions, indicating that traditional downtown is within good proximity of UNL, West Haymarket, South Downtown, and Antelope Valley, including the Telegraph District. Why Not Bennett Martin Public Library? The pressing need to replace Bennett Martin Public Library, our current Main Library, has been apparent for years. A Main Library Study was completed in 2003, concluding that Bennett Martin Public Library could not meet future needs, and was unsuited for expansion or renovation. The 2012 Main Library Vision and Concept Study came to a similar conclusion. It is not representative of our community’s value for education. The central courtyard, while beautiful, creates many small and inflexible spaces that are not efficient to staff or secure. The building needs substantial investment in infrastructure to continue serving the public. It is difficult to wire for power, Internet access, and 21st Century programming demands. It has been some time since Bennett Martin Public Library could be considered “cutting edge.” The proportion of overall library use represented by the current Main Library decreased with the new and expanded libraries. In light of the 2003 study, the building has been maintained but not improved. Early morning and evening hours were cut at Bennett Martin Public Library due to budget shortfalls. 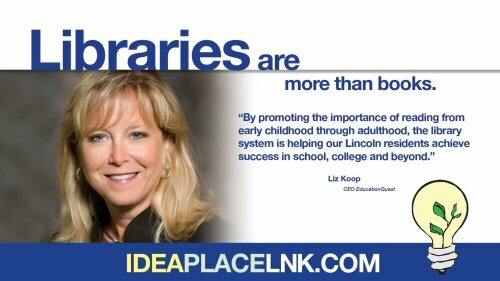 Some might suggest that Lincoln should be satisfied to be a city with a strong branch library system that does not include a strong Central Library. We believe that our city can and should support a strong library system with an equally strong downtown Central Library at its core. Even in its current situation, annual visits to Bennett Martin Public Library have ranged from 244,000 to 530,000 per year in the past eight years. Based on other libraries’ experiences, we would expect the number of visits to double in a new Central Library. Daily visits average around 650 at Bennett Martin Library. Average daily attendance figures at Lincoln’s downtown YMCA and the Lincoln Children’s Museum are very similar. A new Main Library would provide significantly more foot traffic in this part of downtown in comparison to current conditions. Why Not Build a New Library on the Bennett Martin Library Site? The quarter-block site would require at least four floors to result in the building of necessary square footage (107,000 square feet). In order to staff and secure the building efficiently, we prefer only two public service floors. This would not allow for provision of additional parking on or adjacent to the site, one of the community’s most often-requested features. Why Not Create a New Library by Razing the Bennett Martin Library and Combining New Construction with the YWCA Building? Library staff asked Jack Poling, the architect from the M S & R firm of Minneapolis who worked on the Main Library Vision and Concept Study, to evaluate the YWCA Building for potential expansion with new construction to create a new library. Mr. Poling has worked on several adaptive re-uses of existing buildings. In this case, he did not recommend adaptive use of the YWCA building in combination with new construction. His primary areas of concern were that the “ground floor” is several feet above sidewalk level, that there are many interior load-bearing walls, and that the ceilings were too low to accommodate the public spaces necessary to a new library. These factors would make design of an efficient and effective facility very difficult. Further, this would not allow for provision of additional parking on or adjacent to the site. The availability of the Pershing Center Site represents a rare opportunity. It is in the core of downtown, near areas of major reinvestment in all directions, including the University of Nebraska Lincoln, the West Haymarket, South Downtown and Antelope Valley, including the Telegraph District. It is a well-known site that links the State Capitol with the University, away from the major arterial routes through downtown, but near enough for ease of access. The Library Board is interested in exploring partnerships with other entities who may be interested in being neighbors or partners on the Pershing Center site. The decision regarding the future use of the Pershing block rests with elected officials, including Mayor Chris Beutler. The Library Board first expressed its interest in the Pershing site in 2005, and several City planning documents have recorded this interest. In 2011 the Library Board recognized that enough had changed in Lincoln and in the field of library services to warrant a new Main Library study to supplement the 2003 study. Over $90,000 of privately –raised funds was invested in this undertaking. A major task of the 2012 Main Library Vision and Concept Study was to evaluate a number of potential downtown sites. Through the process of thoroughly evaluating many potential sites, Pershing Center rose to the top in comparison, with a long list of advantages. “There are several reasons why [Pershing Center] would be a great new home for a Main Library. Proximity to downtown customers, public transportation, and bike traffic were all important location factors. Pershing sits on an entire city block which was noted as a requirement based on programmatic needs. If the building was to be renovated and the existing seating bowl removed, the existing structural system is conducive to adding a second floor to create program space. Underground parking is already available under the existing building and could be utilized in either a renovated or new construction design. With the addition of onsite stalls, the required parking stall counts could be achieved on this site. Both the location of the block on the existing Centennial Mall and the amount of open space on both the north and south sides of the existing building allows for the possibility of outdoor education opportunities and outdoor program space for a Main Library. Renovation and reuse of existing structures is a more environmentally sensitive solution than demolition and new construction. Library consultant Jack Poling added an additional comment in regard to the study: “I also believe Pershing is the very best place for the library. “ Mr. Poling’s remarks reflect his experiences with effective re-use of buildings, the placement of Pershing within the downtown core along Centennial Mall, and the City’s ownership of the site. The Library Board Downtown Development Committee directed the consultants to spend ample time and attention on evaluation of other sites, to measure the potential of the Pershing Center Site in comparison to them. The study area spanned West Haymarket through Antelope Valley. In-depth descriptions of this work can be found in the Main Library Vision and Concept Study report, pages 21-26. Why don’t you consider additional sites for a Central Library? With so much activity in downtown Lincoln from the West Haymarket to Antelope Valley, the Library Board recognizes that additional sites may come forward for consideration. They will consider those that are suitable and appropriate.